CHICAGO (WLS) -- Rescue crews worked to free a driver from a car that wrapped around a tree early Thursday morning on southbound Lake Shore Drive on Chicago's North Side. First responders arrived around 6:20 a.m. at the scene of the pin-in crash near West Wilson Avenue. 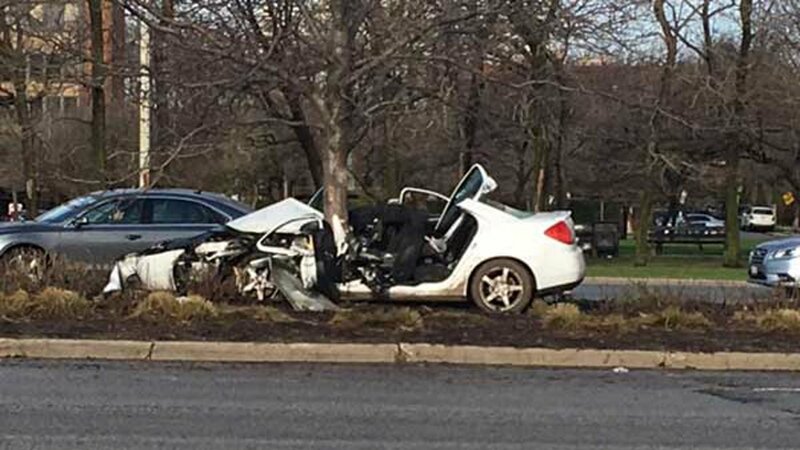 The car was apparently heading south on Lake Shore when the 60-year-old man behind the wheel lost control, drove onto the median and hit the tree. Emergency vehicles blocked the left lanes on both sides of Lake Shore as they pulled the driver out of the car. He was rushed to Advocate Illinois Masonic Medical Center in critical condition. A 34-year-old woman who was riding in the car refused medical treatment. Roads were slick and strong winds were blowing in the area at the time of the crash. Chopper 7HD flew over the scene, showing a large pool of water near the crash site. The cause of the crash remains under investigation. The Major Accidents Investigation Unit is handling.